Oh H1N1 – How I Hate Thee.. In the spring of 2009, a new flu virus H1N1 (swine flu) spread quickly across the United States and the world. 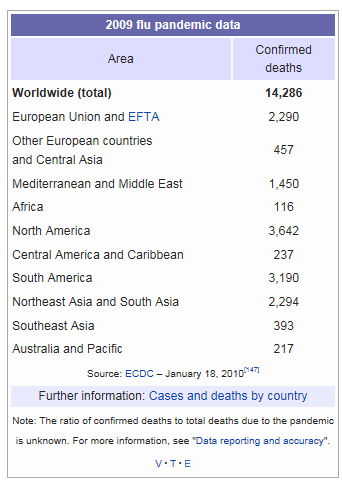 In June 2009, WHO declared the outbreak as a Pandemic. The CDC estimates that 43 million to 89 million people had H1N1 between April 2009 and April 2010. They estimate between 8,870 and 18,300 H1N1 related deaths. It is now a human seasonal flu virus and getting your flu shots is your best protection against it. I think I have reminded you of all what it was about and why the media was going all crazy about it. 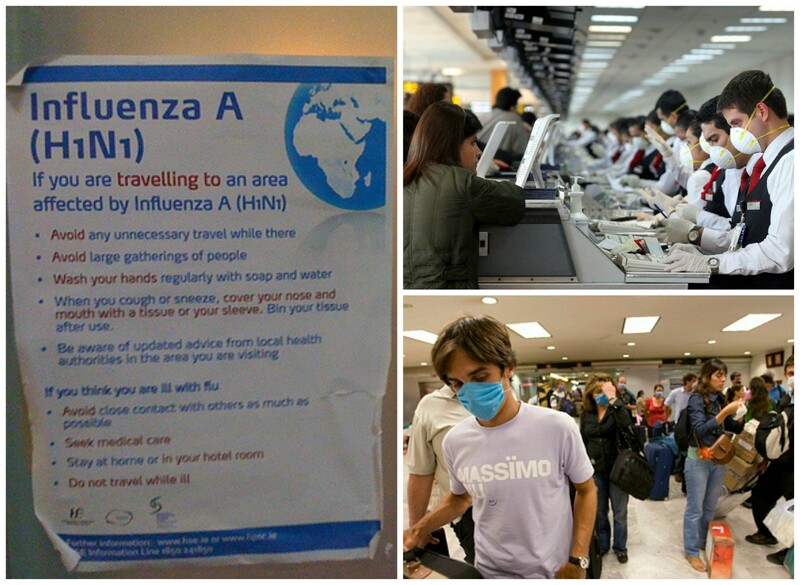 As we flew back to Doha, there was a lot of scare as WHO declared H1N1 as a Pandemic. It made me nervous specially with a toddler.. I had disinfectant wipes in my bags…wiping everything before Violet would touch anything at the airport or the plane.. sanitizing our hands like a maniac! The scene at the airport was scary.. People wearing masks and gloves, warning signs everywhere, the airport staff asking you a million questions about if you have any symptoms etc. etc. We finally reached Doha and Mr. 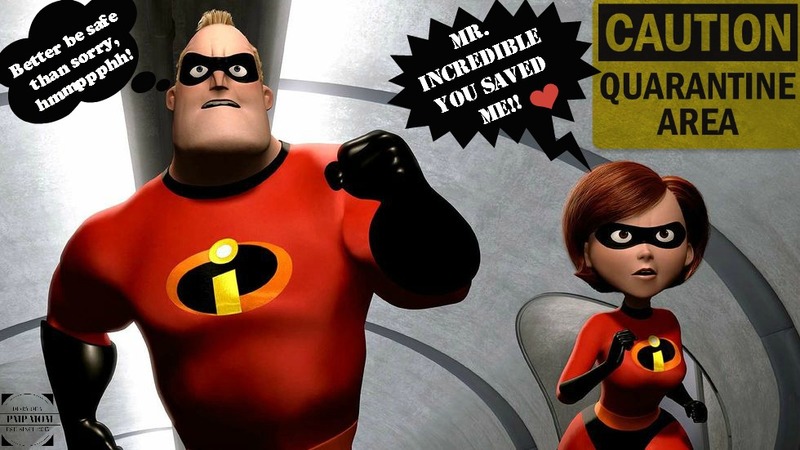 Incredible was very happy that the journey with a maniac mom was over (he had no idea what was coming ahead… ). Two days after we reached Doha, I (yes, unfortunately the maniac herself) developed flu symptoms – high fever , runny nose, sore throat (basically all the works…). I was super duper worried, not for myself but WHAT IF, it IS H1N1 and I give it to Violet (the way every mom thinks…). I waited for 2 days.. moved myself in a separate room .. tried to do everything possible to keep my germs to myself.. but the warning signs I had read at the airport kept haunting me..
Let me tell you a little more about my self … I cannot break rules.. (well, I did while I was growing up but not anymore..) , specially the written ones ( and my husband is the opposite… arrrgghhhh ). If its written some where, “Don’t Do This”, I swear I won’t! ( I actually CAN’T). If there is a sign that says “Keep Off The Grass”, I would die of guilt if I had to walk on that damn grass! This sign haunted me for 2 days when I had fever and it wouldn’t go down.. I kept on saying to my husband that I want to go see the doctor and get it checked just to rule it out. He gave up after two days of trying to convince me that I was just panicking for no reason.. So we went to the Health Centre. The doctor checked me and then took a throat swab to test. I was expecting that he would ask me to wait till the results come back (In my experience the strep tests results came in a hour or so) and then go home. But then the UNTHINKABLE happened.. while I was waiting in the room for my results, the doctor had arranged for an ambulance to transport me to the hospital. I was so confused as to what is happening and no body was answering my questions! (They were probably afraid I am gonna run away if I knew… and I am sure I would have!!!) So I left in the ambulance with them leaving Violet and Mr. Incredible totally confused…. During the ride, I kept asking questions…the nurse was not answering my questions.. neither were the paramedics.. they would just smile at me.. and say its going to be okay! (and It was NOT OKAY! ). They took me to a Quarantine Area. I was taken to a room (which by the way was no less than a 5 star hotel room, with a TV, Internet, Phone, even a hair dryer..) and was told that I will need to stay here till the results came. My instant reaction was “How long would that be?” and the doctor said, “It could take up to 5 days but may be it will come earlier…”. I was given Anti Viral drugs & other fever reducing medicines. Every day the nurse came to check my temperature and vital signs. The food was kept outside in the corridor and I had to wear a mask to go outside of the room and get my food… It felt like living in a prison. I missed Violet terribly! I couldn’t sleep, I couldn’t eat a thing….. My husband came to give my stuff (clothes, laptop, movies and some books) but he had to leave that at the reception downstairs. I couldn’t meet him. The assumption was, I am H1N1 positive unless proven otherwise. Every evening I waited for the nurse to tell me if the results came in or not and everyday she said ,”Not yet”.. On the 5th day when I was expecting my result (my husband came to pick me up as well..) I was ready to leave , all packed. Plus I was all better.. my flu was gone – I knew I wasn’t H1N1 positive.. So the nurse said .. “Oh, you know … none of the results came today.. we will get it tomorrow morning”. I couldn’t stay one more night! NO WAY!!! I called Mr. Incredible.. he called everywhere possible to get to the person who actually sends the results to the premesis every evening and after an hour of him tracing people (while I prayed hard & refused to get up from the prayer mat until I get the result) .. we found out that my result was NEGATIVE!!! ( YAAAAYYYYYYYYY and yeah Mr. Incredible saved the day once again!). So this time folks, I went today and got the appointment for Flu Shots for not only the kids but the whole family (including the nanny 🙂 ). Not taking any chances! Get your Flu Shots everyone!!! Loved it Shehar. Haven’t read your posts for a while. You seem to be enjoying this. Keep writing! I’m actually trying to get our health cards sorted in order to get the shots.